A wide range of things, not all of them good. Also, if you don’t read anything else about GamerGate, you should read the fourth link. Do you think in emoji? I certainly don’t. Though I don’t use them, except for hearts, some smiles and occasionally animals when I’m feeling annoying. I use stickers on Line and Facebook Messenger a lot more often (and I enjoy them more, to be honest) than I’ve ever used emojis. I have, on occasion, wished that the stickers were available in my texts. Today’s links deal with issues of death, chemistry and awesomeness. Who knew? Elements with the greatest supply risk. Red is high, blue is low. Today’s links include several very long reads and I’m sorry about that first link. I know it’s depressing, but if there are some gems as well (especially the two sets of photography links). 10 Ways The World Will Get Worse In 2015 The World Economic Forum isn’t optimistic about the planet’s prospects for a happy new year. (Fast Company/Co.Exist) Note: Let’s get this one out of the way first. ‘Serial’ and White Reporter Privilege On cringing through the mystery. (The Awl) Note: Though I’m part of podcast myself and people have rec’d this one to me, I never found the time to start and now I’m glad I didn’t. The Ebola Wars How genomics research can help contain the outbreak. (The New Yorker) Note: Equal parts heartbreaking and heartening. Also, this article clearly shows how treatment changes depend on the color of your skin and where you live/where you’re from. 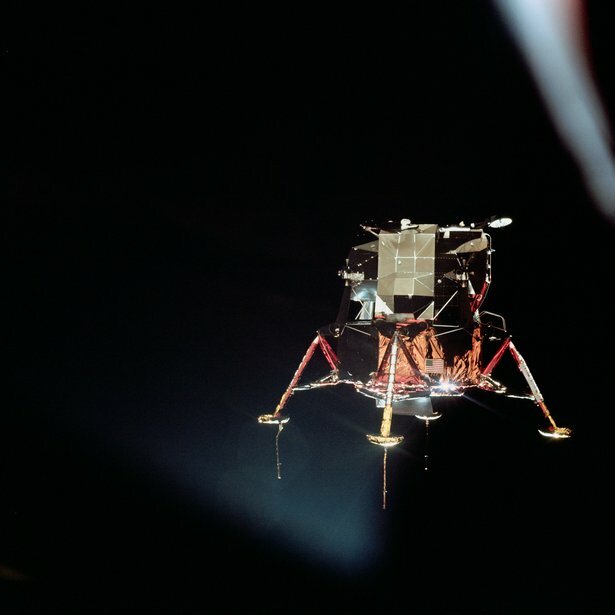 Lessons In Combining Art And Science (And Taking Amazing Photos) From Rockstar Astronaut Chris Hadfield Astronaut, social media expert, and music video star Chris Hadfield talks about art and science as two parts of one whole, and talks us through his eye-popping space photos. (Fast Company/Co.Create) Note: Now, don’t you feel better? I know I do. The VHS-Era Internet (YouTube) Note: I want to watch some of these, but I haven’t yet. Some of these are older links I’d forgotten to share before. Also, the Vincent van Gogh link is very long, but fascinating. There are also some pretty great links, like the one about cats and then there’s that one about Thor’s hammer. Why Banksy Is (Probably) a Woman: The world’s foremost street artist is a social justice warrior and a viral media master. She could be anyone. (City Lab) Note: Aside from a failure to understand what graffiti (street writing) is (it is not catcalling, fyi), this article is interesting. I wouldn’t call it good, but the author makes a decent argument for Banksy’s gender. William Gibson: I never imagined Facebook The brilliant science-fiction novelist who imagined the Web tells Salon how writers missed social media’s rise (Salon) Note: My favorite article of the week because William Gibson. If you don’t understand … you don’t know me very well. 9 questions about network neutrality you were too embarrassed to ask (Vox) Note: I support net neutrality and you should, too. Like every good Star Trek fan, I was eagerly awaiting John Scalzi’s book. I’d purchased a copy for my sister for her birthday and she’d loved it. Which meant that I’d probably end up loving it, too (and, well, I did). I’ve been a Star Trek fan for as long as I can remember. I’m too young to have watched the original series, but I grew up watching TNG. I’ve seen almost all the movies in the theater (perhaps not the earliest ones, though my earlier ST memories involve VGER — my parents even humored my sister and I by naming our Voyager Minivan VGER), as I was growing up and throughout college and beyond. Of course, it wasn’t until the reboot (which I was quite sure was going to be simply awful) that I realized just how much of a fan I am. Once I got over the fact that someone else could, in fact, play Spock (Nimoy will always be Spock for me and perhaps my most favorite character, after all The Voyage Home is my favorite of the films), I feel in love with this new take on the story. It even inspired my sister and I to watch The Original Series on Netflix (which we have also grown to love, in spite of its’ shortcomings). Which brings me back to the topic at hand, Redshirts. I firmly believe that Scalzi’s book is a love letter to both fans of science fiction as well as the Star Trek universe. I don’t know if many people disagree, nor do I much care (my review, not yours!). It was everything I would want in a book about redshirts. Everyone knows who the redshirts are. They blend into the background, we’re not really meant to care much about them (aside for a momentary sadness at their passing) except in the most ironic of senses. 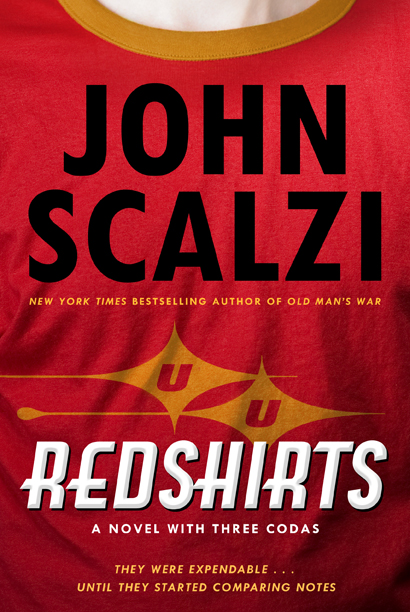 Scalzi plays on all of these stereotypes about redshirts, and then some. In fact, he goes out of his way to bring these redshirts to life in a way that most people would only write about in fanfic. And, perhaps, in some ways Redshirts is also an ode to all those fanfic writers who take such a creative view on the things they love. I’ve read that some people were hung up on the fact that it was a book about characters on a tv show becoming self aware, but honestly, that’s what made it so good. It’s not really Star Trek, but it didn’t need to be. The novel itself referenced the original show(s), it made sure we knew what we were reading and then it took everything we knew, dumped it in a blender and gave us this fantastic, fun and moving novel. I especially liked the three codas (which I know were a sticking point for some people). I like conclusion, I think well thought out conclusion and while the tv show within the novel had an open ended conclusion (which I liked, because the actual ST shows ended in a similar fashion), I liked that we got a sneak peek into some other major players in the novel itself. It’s not a book for everyone. I’ve noticed that people my parents age (60s+) tended not to like it as much. I’m not entirely sure why, but young people (20s and 30s) seemed to love it. Of course there are always exceptions, but that’s just my personal experience. I loved the book, teh characters and the idea that these redshirts finally got a story of their own. Recommended? Of course. A must for Star Trek fans of all types. For science fiction fans who like a good, entertaining (and amusing) story. But also for fans who are into meta fiction (it’s a nice musing on Hollywood/movies/tv writing as well as ST itself). If you’re looking for a quick read, something a little different and much lighter than your average George RR Martin-esque epic, definitely check out Redshirts. Here are some links that I’ve come across over the past few days. Alone in the Ocean (Now I Know): A short article about a whale, called the 52 Hertz whale, who speaks at a different frequency than other whales and is, therefore, forever alone. Poor guy, though he/she seems to be surviving just fine, somehow. Jane McGonigal: The game that can give you 10 extra years of life (TED): I think I was linked to this via Library Link of the Day, but I don’t remember. It’s a 20 minute video about McGonigal, who designs games, and figured out a way to make our lives better. I actually recommend the video because it’s interesting, kind of cute and really fun(ny). The individual cancer risk from this amount of radiation pales in comparison to lifestyle risk factors for cancer like smoking, diet, and fitness. However, one of the central tenets of radiation protection is a concept called ALARA – As Low As Reasonably Achievable. The idea is that one should only use as much radiation as is needed, and no more. Given that there is a perfectly good alternative that doesn’t use ionizing radiation (microwave-based scanner), in my opinion it is irresponsible to use radiation when it isn’t needed. Living With Voices: A new way to deal with disturbing voices offers hope for those with other forms of psychosis (The American Scholar): I’m not that familiar with people who hear voices (external or internal), aside from what I’ve seen in TV shows (mostly likely wrong, too) so this article was both interesting and enlightening. Deniers, disgust, and defamation (Bad Astronomy): My favorite Astronomer, Phil Plait, talks about the anti-science movement and how they’ve taken to personally attacking scientists (because they can’t attack the science). It’s pretty gross, but at least people are standing up against them. And, finally, have a picture of a newly born baby manatee (to a rescued mother) and a series of photos of Kang Daesung, my favorite member of the Korean group Big Bang, from a recent concert in Shanghai, China.